Goda arrives home from after-work drinks to find his girlfriend of 10 years has shot herself. The initial shock soon gives way to curiosity as he tries to uncover where she got the gun from. His search for understanding, both the mystery of the origin of the weapon, and the more ineffable reasons for her committing suicide. Goda is soon scouring gun enthusiast forums and makes his own firearm. He wanders through the dark underbelly of the city, far removed from his daily life at an advertising agency. His journey brings him into contact with Chisato, a member of a street gang who is engaged in her own struggle with self destruction. 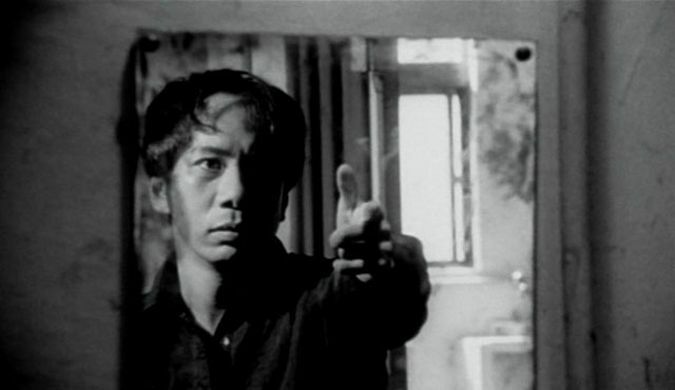 Shinya Tsukamoto (Tetsuo) writes, directs and stars in “Bullet Ballet”. The film is a clear development of his style from his earlier Tetsuo films, blending arthouse visuals with the brutality of an exploitation film. Shot on 16mm Black and White, with frenetic cuts, this film has more narrative structure and the editing is reigned in a little which helps make the film more comprehensible. Use of cuts to black, strobe lighting, and more can make for uncomfortable viewing, but these techniques are used sparingly and are rarely gratuitous. There are some stand-out examples of the power of film, in the rapid cuts between gunshots and scenes of war and destruction, that help the viewer sense the terrible power of this weapon. When a gun is aimed at a character in the film you are in no doubt about what the potential consequences would be. The film uses some fantastic locations, dark alleyways and abandoned buildings, and they are shot and directed to their best effect. Dripping water, the play of light and shadows, and the sense of a broken vision of what the city should be all create the perfect backdrop to the drama. The grime and decay is almost palpable through the screen. Tsukamoto, who also plays the lead character, is good as Goda, capturing the various emotions that Goda is going through: anger, sadness, fear. Kirina Mano gives a great performance as Chisato, tough with an underlying fragility. Many of the characters are ambiguous in nature and the film is far from a simple good versus evil tale; instead it feels like it is trying to unravel the morality of an incomprehensibly complex system that is largely dictated by uncontrollable feelings. The supporting cast all do a good job, the gang members are suitably menacing, almost the human embodiment of the dark city streets they inhabit. Tsukamoto weaves a number of themes and ideas through the simple narrative creating a work that really wants to say something about the problems it addresses. For example, Goda’s obsession with the gun become a more general rumination on the problem of violence in society. Likewise, in attempting to work through his anger and upset at his girlfriend’s death, and fathom some reason for it, he is in fact representing a deeply felt angst in Japanese society about this issue. Suicide is a serious problem in Japan and the film has two characters that seem to have this self-destructive urge. While “Bullet Ballet” rightly shies away from giving any definitive solution to the problem, it does shine a light on it, questioning to what extent this self-destructive urge is perhaps part of a larger undercurrent of violence in society. Goda’s obsession with the gun as a solution to his anger and sense of powerlessness at the loss of his girlfriend shows that Goda is not above this descent into violence.